The lying pig that currently holds the highest office in the land has no class and is unfit to appear in polite society, much less to lead our nation. His continued attacks on a true American hero is shameful. This piece of garbage is disgusting as a human, much less a leader of our nation. He is a pathetic little man who cannot stand the thought of being in the perpetual shadow of real heroes. 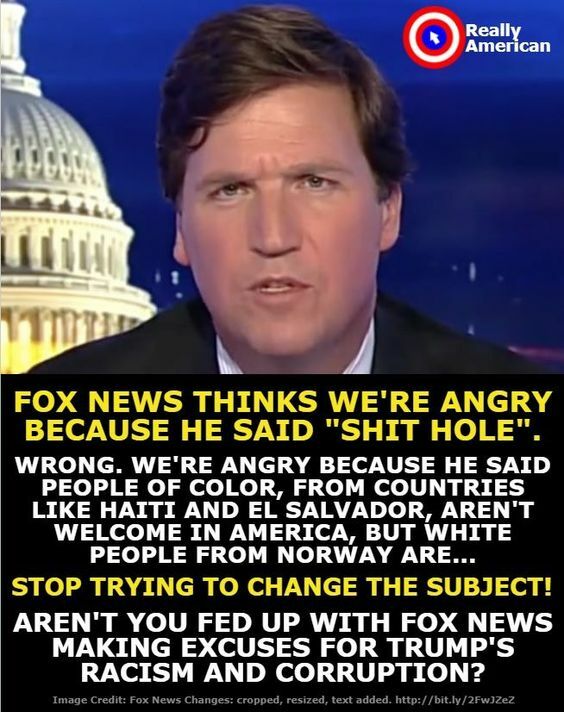 Those that continue to support #BLOTUS are either willfully ignorant of reality or hold the same racist, bigoted and completely immoral values as he does. What about this man’s character or actions would any decent person want to emulate? This entry was posted in Facts & Statistics, News & Views and tagged bigot, BLOTUS, character, classless, crude, disgusting, draft dodger, hero, ignorant, immorality, liar, prisoner of war, racist, respect, SACK, shame, Star Tribune, Trump, unpresidential, values on March 22, 2019 by Ray Buchanan. 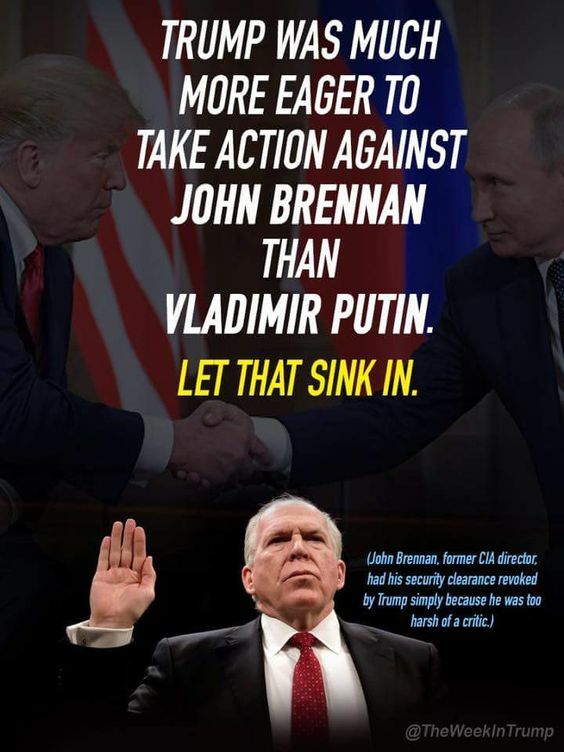 This entry was posted in Facts & Statistics, News & Views and tagged action, CIA Director, Congress, crime, criticism, guilt Republicans, guilty, John Brennan, lies, presidency, racist, shame, traitor, treason, Trump, Vladimir Putin on August 23, 2018 by Ray Buchanan. 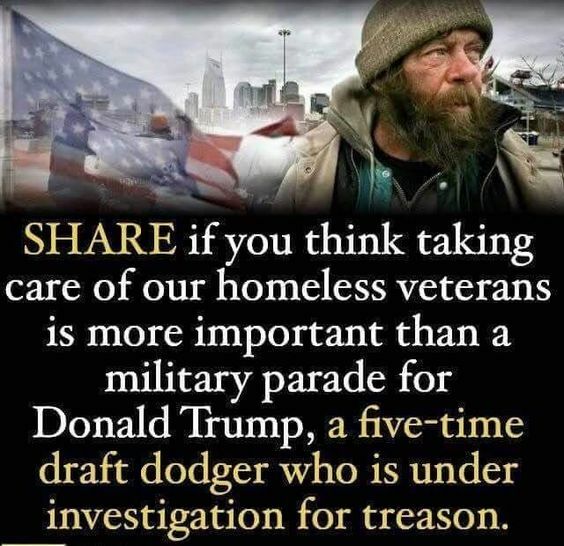 The only military parade our lying, racist, traitor of a president should get is in Moscow from the country he serves. Military parades should be reserved for American heroes who can never be given enough respect. Five-time draft dodgers deserve nothing but shame and disgust. This entry was posted in Facts & Statistics, Hunger & Poverty, News & Views and tagged American heroes, caring, compassion., disgust, draft dodger, homelessness, investigation, lying, military parade, Moscow, racist, respect, Russia, shame, traitor, treason, Trump, veterans on July 28, 2018 by Ray Buchanan. This entry was posted in Hunger & Poverty, News & Views, Quotes and tagged @nakedpastor, asylum seekers, biblical, bigotry, children, fear, immorality, lying, pain, press conference, racism, shame, suffering, ugliness on June 24, 2018 by Ray Buchanan. Trump continues to turn out more lights in our nation. We see the darkness getting deeper, spreading. As the darkness deepens the roaches are becoming more confident. They know the darkness is their friend, and they know that a immoral, racist, power-mad autocrat is clearing the way for them to feed. I detest roaches. I detest racists. I detest what Trump is doing to encourage the roaches in our country. And every day the darkness deepens. 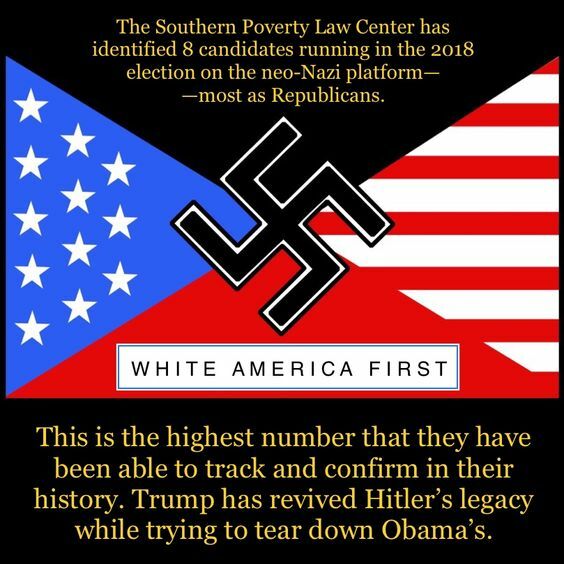 This entry was posted in Facts & Statistics, Hunger & Poverty, News & Views and tagged autocrat, country, darkness, dishonor, hatred, immoralit, legacy, neo-Nazis, power-mad, President Obama, racism, Republicans, revival, roaches, shame, Southern Poverty Law Center, Trump, White America on June 2, 2018 by Ray Buchanan. I have watched the video and have listened to the chaplain’s prayer. It is a theologically-solid prayer, much like I have prayed on many occasions. It was not partisan. It just lifted up the Representatives’ responsibility on behalf of the least of these among us. But, that was far too threatening for that august body. 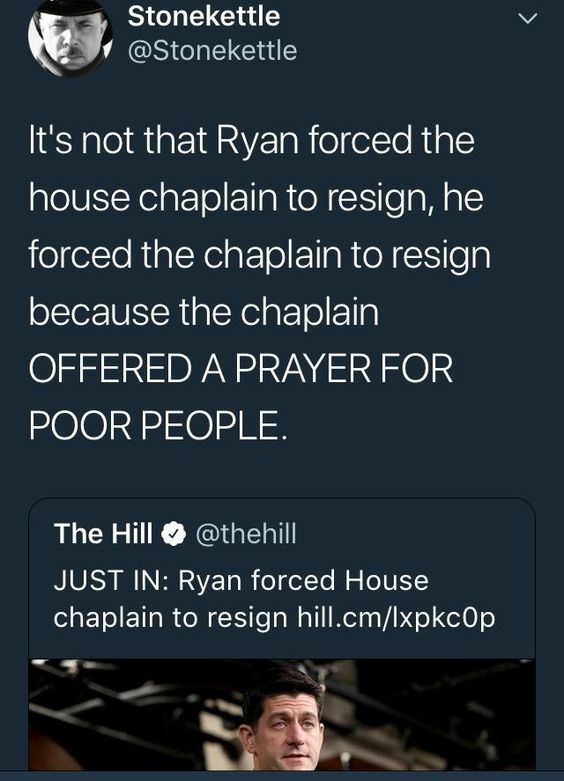 Paul Ryan fired the chaplain for reflecting the light of Christ in the midst of darkness. Shining the light of Christ’s love in a den of thieves causes them to flee every time. Standing up for the poor and hungry, especially to the wealthy and powerful elite, is a good way to shorten your career path. It’s also, however, how you stay on the highway to holiness. Shame on Paul Ryan, and shame on all those in the U.S. House of Representatives who have not stood up against this action. This entry was posted in Hunger & Poverty, News & Views, Quotes and tagged chaplain, Christ's love, darkness, den of thieves, elite, fired, House of Representatives, hungry, light, partisan, Paul Ryan, poor, poverty, power, prayer, resignation, shame, Stonekettle, The Hill, theology, threatening, wealth on April 29, 2018 by Ray Buchanan. I cannot help wondering how many other folks have become ashamed, embarrassed, and dare I say…sickened over how the religious right have stolen and smeared the mantle of evangelism. 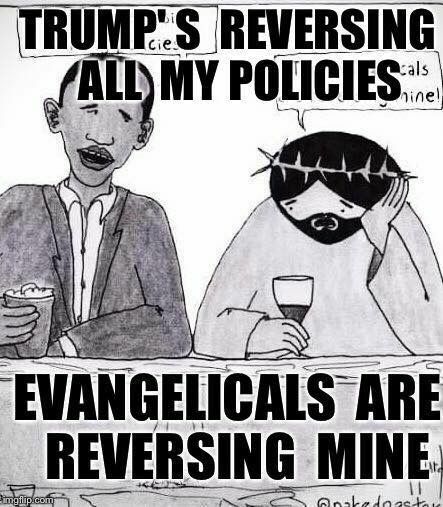 This entry was posted in Hunger & Poverty, News & Views, Quotes and tagged @nakedpastor, beliefs, bitterness, BLOTUS, compassion., discipleship, embarrassment, evangelicals, faithfulness, hatred, love, policies, political right, shame, theft, Trump on April 24, 2018 by Ray Buchanan.